In most of our schools and offices several websites are blocked. Most of these offices and schools are using a proxy server such as squid along with squidguard or danceguardian to achieve access restrictions on users. Most often, the sys admins forget to block internet traffic using other protocols such as ssh , ftp etc. You can beat the web filtering scheme of your network administrator if you can access a machine on internet via ssh. Open ssh server can act as a socks proxy. So . install open ssh server on your home machine and leave it connected to internet. Note down the ipaddress of your home machine. If it uses DHCP , you can install some thing like dyndns client and keep track of the IP address. From your office/school connect to the home machine as below. Open your firefox browser and select file=>preferences->advanced->network-settings. Fill in 127.0.0.1 against the Socks host column and enter 2345 as port. Click ok to save. All your webtraffic will now be tunneled to your home machine beating the local proxy. Enjoy unrestricted internet. Google has recently released version android SDK 1.6. This tutorial will teach you how to install it on ubuntu 9.04. Android SDK is built around Java . So, you have to install Sun Java before trying to install Android. Look at this post for details about installation of sun java development kit on ubuntu 9.04. 3) Unzip the tar.gz file . If you look at the directory now , you will see the following files and folders. The tools for android development is under the tools directory. Since all the android tools are kept under android-sdk-linux_x86-1.6_r1/tools, we must modify the PATH environment variable so that it includes the above directory too.Open a terminal and execute the following. You can also add the above line to your ~/.bash_profile or ~/.bashrc , so that the setting is available always. My PATH variable looks like this after the above command. Now you can test fire your set up . It is a good idea to keep all your android related files in a separate folder. I created a new folder named ANDR for experimenting. All the commands below are executed in that folder. 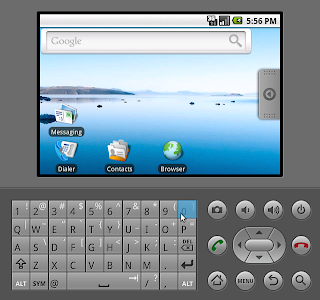 The virtual phones created by android SDK are called AVDs ( android virtual device) .Let us start the experiment with a virtual SDcard and a Virtual Phone. 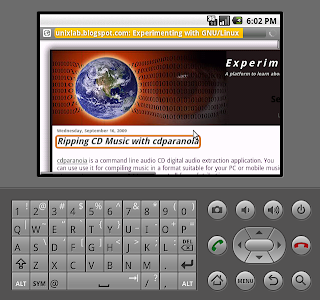 Next, create an android virtual phone named FERMI_PHONE. 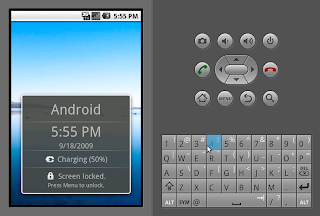 Android 1.6 is a basic Android platform. Press enter to choose no. You will get back the following message. 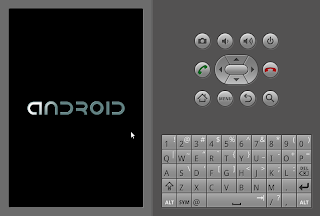 Now start up android emulator. Wait for a moment , your screen will change to the one shown below. You can press menu button to unlock the phone. Now let us browse on the android phone. 5 )Starting development with SDK. 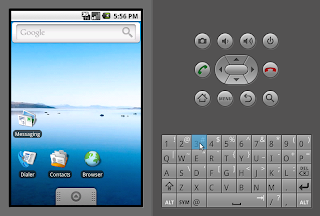 The easiest way to start development on android is via eclipse. The eclipse version shipped with jaunty is some what old. ( Version: 3.2.2-5ubuntu3) . You need a later version for installing the ADT ( android Development tools ) for eclipse. I downloaded Eclipse 3.5 (Galileo) from the eclipse site and installed it . Then completed the following steps. Start Eclipse, then select Help > Install New Softare. In the Add Site dialog that appears, enter a name for the remote site (e.g., "Android Plugin") in the "Name" field. Back in the Available Software view, you should now see "Developer Tools" added to the list. Select the checkbox next to Developer Tools, which will automatically select the nested tools Android DDMS and Android Development Tools. Click Next. In the resulting Install Details dialog, the Android DDMS and Android Development Tools features are listed. Click Next to read and accept the license agreement and install any dependencies, then click Finish. Now your development environment is ready. For running a hello world application, read this entry from the developers guide. 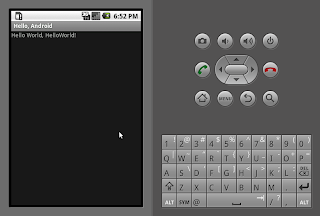 Here is a screen shot of my hello world application. cdparanoia is a command line audio CD digital audio extraction application. 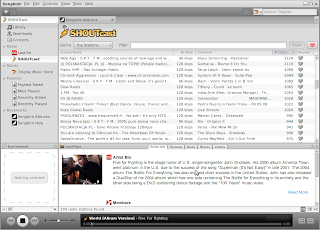 You can use use it for compiling music in a format suitable for your PC or mobile music player. cdrparanoia is available on almost all linux distributiions. For trying out cdpaanoia ,put an audio CD in your cd drive and run the following command from a terminal. The above output show the capabilities of your CDROM , wheither CDDA is supported, SCSI emulation is used etc. Cdparanoia extracts audio from compact discs directly as data, and writes the data to a file or pipe in WAV, AIFC, AIFC or raw 16 bit linear PCM. Here are some examples of cdparanoia command lines that I use. You can use locate command to find out commands, devices, man pages, data files, or anything else identified by a name in the file system. The mlocate package includes a cron job that runs the updatedb command once per day to update the locate database of files. To update the locate database immediately, you can run the updatedb command manually. Songbird is an open source music player from the Mozilla stable. It is under active development and can be run on several platforms. Moreover, songbird offers several integrated services such as integrated music store, several fm and shoutcast station , concert tickets etc. For trying out songbird you can get source/binary from the songbird website. If you are on ubuntu, ready to use packages are available at getdeb. For installation , grab the deb corresponding to your version of ubuntu. You can do anything that you do in rhythmbox. Songbird Rocks !! Some times when you install a new deb package, the system will be broken. We may have to remove the package. These methods can also fail some time. Your only way out will be a manual removal of packages, which can be achieved as detailed below. b) Remove the files one by one.